When you first got your new dog you may have expected him to come with a retrieve installed. After all, don’t all dogs love chasing balls and sticks? Well no - actually not all of them do! You may have struck lucky and got a natural retriever, or you may have a dog that stares in puzzlement at anything you drop or throw. But all is not lost! You can teach your dog to love retrieving. In fact you may be better off having to teach from the start. When I was working in Obedience competition with my dogs many years ago, I had two Border Collies. Rupert was a natural retriever. He loved pouncing on toys, making them scoot away so he could chase them again, grabbing them, tossing them in the air, and racing around shaking them. Can you imagine how hard it was to get a formal retrieve from him? Dear Rupert could lose a lot of marks on retrieve. Dodger, on the other hand, came to me a little later in life and had no idea what to do with objects. So I broke the retrieve down into many separate steps - the first being to hold the item in his mouth - and taught him step-by-step. When it came to competition I always knew I’d have full marks in the bag for Dodger’s retrieve: it was always accurate and faultless. So even if you have a happy-go-lucky toy-fetcher you could still look at tidying up some aspects of his retrieve. It’s so handy to have a dog who can fetch your shoes, keys, or the tv remote without fearing that they will arrive in your lap in many pieces. Check out my new online Dog Training Course teaching new dog owners to achieve lasting results through six weeks of dog-friendly coaching - retrieve included! "I have found your four books extremely useful and continually use them as reference material. I have an English Springer Spaniel, almost one year old, and have been using your methods with considerable success. I would like some advice on how to teach him to fetch as he does not seem at all interested in returning thrown items nor holding on to them for even a short period of time. It doesn't seem instinctive to him. Thank you." "For getting your pup interested in toys, I suggest using foodtoys - kongs with a bit of liver sausage smeared inside, or a lotus ball, or even better an old knotted sock with some bits of cheese or sausage in. Get Charlie to chase it and grab it. Then you can open it for him. After a while you can show him you're putting food in, then chuck it away, so he has to give it to you to open. You can gradually build up a desire to hold the toy. The first thing is to plug in to the instinctive chase drive. Let me know how it goes!" "Tried the sock/return idea. Only shows interest in chewing at the sock to get at the contents. I've ordered a lotus ball so that may work. Perhaps I'm doing something wrong here." "When Charlie’s about to grab the sock, twitch it away on the ground a few inches. As long as he tries to get it, do this two or three times - then when he grabs it, open the sock and give him a bit of the food. Then twitch it again. You want to stimulate his chase instinct. You know how rabbits run, freeze, twitch whiskers, then dart again? This is the action you want to simulate to get his chase going. He may start by just stamping on it - he'll graduate to catching it in his mouth. If you put the sock on a string that will help to get him interested without crowding him - some dogs don’t like you leaning over them while they are focussed on a toy and will shy away. See this video of fun with a flirt pole. Once you've got the chase going you're halfway there! And I was so pleased to hear from Kevin a little later. It can be very disappointing when you take time to help someone and never hear from them again … not so with Kevin. "With a combination of your advice including a lotus ball we have success. Charlie is eager to return to hand any thrown items on demand. Thanks again." 10-week-old Loki learns to tug with all his might! So you can see the key to this is to break the problem down into tiny steps and work on just one of them to begin with. In Charlie’s case it was getting him to find his chase instinct. Once he was keen to chase the object to get a tasty reward, he was able to start enjoying the actual chase and the toy itself. But if you shout at a puppy for picking up something you don’t want him to have, one of two things may happen. He may be so terrorised by your outburst that he never picks anything up again for fear of being shouted at. Or he may say “Game on!” and try and get you to chase him. Of course if you do, he has succeeded in teaching you a new game that he will always win! So with a new puppy, tidy up and ensure the only things he can get hold of are his own toys. And I like there to be a wide range of toys so your puppy can choose what appeals to him and fits his mouth. "Could you give a few tips on how to get your dog interested in running after his toys and bringing them back please? My Dodger loves his ropes and used to run after them when I threw them in our garden, but now he’s more interested in lying on the grass and just chewing them. I never could interest him in bringing them back to me, but when I picked up another of his ropes he dropped the rope he had and ran to take the rope I had." Another Dodger! And this time the writer had inadvertently hit on an answer to this problem. 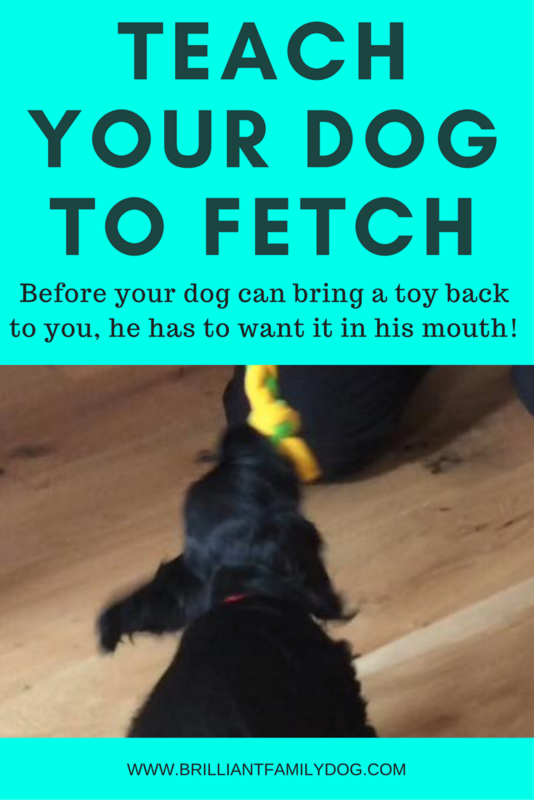 Using two similar toys and getting your dog to switch his attention from one to the other will transform into a retrieve over time. The key is to make the toy you’re playing with alive and exciting, then when you want to swap to the other toy you let the first toy go limp and dead while the other toy springs to life in your other hand. Remember you’re harnessing the instinctive drive that every dog - whatever the breed or history - has: to locate prey, stalk it, chase it, catch it and kill it. Your dog will soon let go of the first toy and transfer to the second. Once he enjoys the engagement with you of pulling on the “live” toy, he’ll know that toys are more fun when you’re involved. Then it’s a short step to you letting go of the toy mid-game and watching him bring it back to you - nudging your hand to get you to play again. Here’s a great game which shows you how to get a fast and engaged retrieve. You need to follow the directions closely. What sort of toy should I use? It’s a mistake to inflict your idea of a retrieve toy onto your dog. Let him choose! Offer him a few different toys to see which engages him more. For tugging games I favour a soft fleecy plait, long enough to keep hands safely away from teeth, and narrow and soft enough for your dog to grip it comfortably. Balls work for many dogs, but can be hard to get out of their mouth when they bring it back - all wet and slimy! So I like to use balls on ropes, then there’s something you can hold on to while you wait patiently for your dog to let go. Don't spoil his fun by insisting on him releasing it instantly. Once you’ve taught your dog to bring back things you throw, you’re ready to teach him how to catch a frisbee! All mine love their frisbees, and as each has his or her own toy, there’s never any arguing over the toys. They’ll simply ignore any toy unless it’s their own.